This guide has been written with a specific purpose in mind and that is to get people started in all-grain brewing. Our experience at the WORT HOG Brewers club has been that many people would like to make their beer using the full process but that they don’t always have the time, knowledge or money to start something that looks like a heck of a lot more work than what they’ve been doing up to now with kits or extracts. I think its also fair to say that the South African experience has been that many people do not achieve the results they’re looking for in kits and, having tasted what others are managing to make via the all-grain approach, would like to make the transition. The homebrew tasting sessions at our regular club meetings prove this time and again. 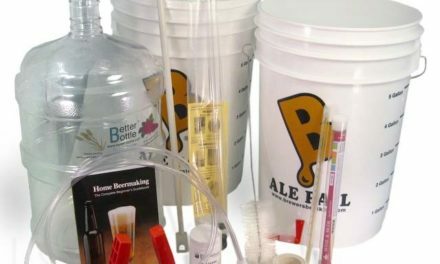 Keep in mind though, that for many people, the relative simplicity and short time required to make a kit beer are reasons enough to stay with that route. However, for those of you looking for total control over your brewing process and the desire to make commercial quality beer, this article is here to help you get over that initial hurdle. 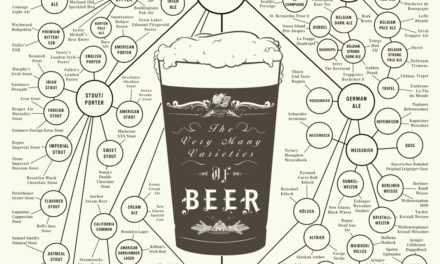 The aim of this section is to give you an overview of what beer making is all about and, in it, I have tried to balance the need to get the absolute basics across with the risk of providing too much detail. The approach taken here is to explain, in what one might call ‘medium detail’, how the whole process fits together and why we do certain things at each stage in the process. I am not expecting the brewing novice to feel 100% comfortable on their first pass through but I do think the level is such that a few passes will allow you to grasp the basics and to do so in such a way that you can then go straight into brewing your own beer with the all-grain approach. First, you prepare yourself a ‘sugary solution’, meaning ‘sugars’, from whatever source, dissolved in water. And secondly, you introduce a micro-organism, called ‘yeast’, into the sugary solution. The yeast’s job is to convert the ‘sugars’ into two by-products, namely, carbon dioxide gas and alcohol. If you derive your ‘sugars’ from grapes, then the end product is called ‘wine’. If you derive your ‘sugars’ from honey, then the end product is called ‘mead’. If you derive your ‘sugars’ from rice, then the end product is called ‘sake’. 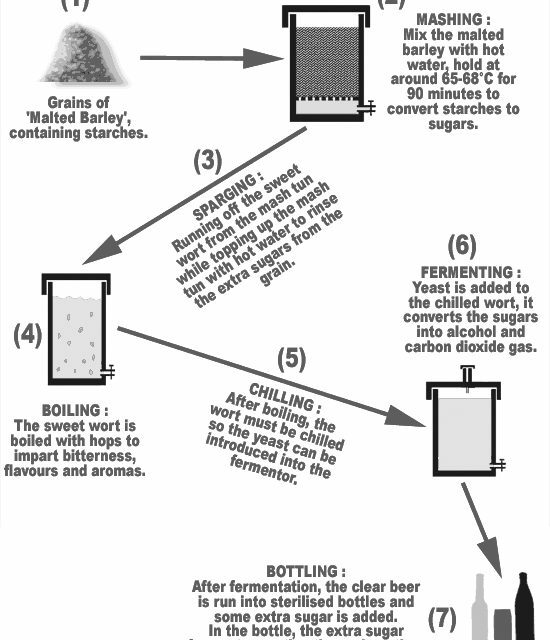 And, if you derive your ‘sugars’ from a cereal grain such as barley, then the end product is called ‘beer’. So, when making beer, at some point, you will have to produce yourself a ‘sugary solution’ using barley. And if you’re wondering why I keep putting quotation marks around the word ‘sugar’, its because most of us assume the word ‘sugar’ to mean the white stuff we throw into coffee. In reality though, nature has provided us with a wide range of ‘sugars’ and our job as a brewer is to control which sugars we get and to control their conversion by yeast into a yummy end product. And if you can learn how to do that, then you’ll be a brewer! Focussing in on barley grain, it is a cereal product grown widely throughout the world and is obviously the seed of the barley plant. Because its the seed, it needs to store a whole lot of ‘food’ for itself so that when it eventually falls into the earth, it has enough nutrition to grow itself a root and so start to sprout, one day growing back into an enormous barley plant. The key to the seed keeping its food store though is that the store must not be soluble in water because, the first time it rained, all the goodness would be washed out of the grain. So, nature devised a way of storing the food in the form of something called ‘starch’. And the form of starch it chose isn’t water soluble. Clever. So what happens in nature, if the barley seed happens to fall to the ground, is that it waits until such time as it thinks the temperature and availability of water is to its liking and then it starts to germinate. What happens inside the grain during germination is that the seed lets loose some enzymes which proceed to convert the insoluble starches into something more useful, namely soluble starches and from there it can further break down the starches into useful food material in order to germinate and grow. In the world of brewing though, if we allowed the barley seed to fully germinate, it would use up its food store and we wouldn’t be able to get anything useful out to use in our beer making. So one of the first steps in brewing is for the barley seed to be harvested and kept dry. By keeping it dry we prevent it from going into spontaneous germination, after which it would be of no use to us. And this is precisely why we invented people called ‘maltsters’ who have the job of artificially germinating the barley seed and then, just before it looks like its about to go all the way, they cruelly intervene, drying the barley so as to stop its germination process. This then provides a very stable, dry, barley seed with its insides converted into a form suitable for brewing beer, i.e. water soluble! The process by which the barley is artifically germinated and dried is known as ‘MALTING’ and the barley produced in this way is known as ‘MALTED BARLEY’ or just ‘MALT’. 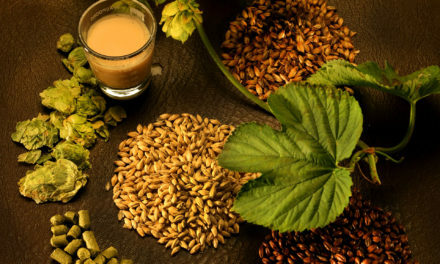 For the brewer, the ‘soluble starches’ that now remain in the malted barley grain, provide a rich source of ‘sugars’ with which we can brew beer and the first job the brewer has is to go get these ‘sugars’. And we do this in a process called ‘MASHING’, discussed in the next section. Mashing simply means mixing barley grain with water at a predetermined temperature and waiting 90 minutes. During this time, the ‘soluble starches’ dissolve in the water, as do the enzymes from within the barley grain. Once dissolved in the water, the enzymes go to work breaking the starches into a range of ‘sugars’. And your job as brewer is to control, at the very least, the temperature of the mixture. The vessel in which you mix the grain and water needs to be nothing more glorified than a plastic bucket if you so wish but, at the very least, you should make sure its insulated so that the temperature doesn’t vary too much over the 90 minutes. This container is called a MASH TUN and, for most beers you will make, can consist of a bucket with a false bottom in it. The false bottom, essentially a flat plate with loads of small holes in it, seperates the grain-water mixture from where the tap runs the liquid off from and is a key design aspect of any mash tun. In practise, as explained later in the equipment section, the mash tun can be very easily made by using a 25 litre plastic bin like you use for fermentation. But more on that later ! To make a mash you just put heated water into the mash tun and then mix in the grains of malted barley. At the start of the mash, the mixture in the mash tun could be sitting at something like 68°C and as the contents of the barley grains start dissolving in the water, the water tends to become cloudy. So, when I said the starches dissolve in the water, well, they mostly do, they are fairly big in molecular terms though so they tend to scatter light, which in simple terms means the liquid will start to look hazy. If this bamboozles you, forget it, the stuff looks hazy. Now, one of the most amazing things about the mash is that the grain is all squashed up in this load of liquid and yet you are able to open a tap at the bottom of the bucket and run off crystal clear wort. The reason for this miracle is that the grain is able to form its own filter bed that prevents small particles getting out the tap and this filter bed is hugely helped by having that false bottom in place; otherwise the grain would come out the tap too ! So, after leaving the grain-water mixture to sit undisturbed for 90 minutes, we slowly open the tap and run off the sweet wort and that’s the formal end of the mashing step. Sparging is a great word, like nothing you’ve heard before and really makes you sound all geeky when you tell someone what you’ve been doing. In essence though it is simply a brewer’s way of saying ‘rinsing’. You see, after 90 minutes, the liquid in the mash tun contains a load of ‘sugars’ all dissolved in it and if you taste it it will be very sweet. However, the grain has absorbed a lot of the liquid and so a lot of the sugars are still sitting in the grain hiding from you. In the simplest case you can open the tap, run off the contents over a period of say 25 minutes and the grain bed will then run dry. However, you will only have managed to capture (say) half of the sugars that the grain contains and so the brewer will then refill the mash tun, soaking the grain, getting the sugars to come out of solution so they can be run off again 15 minutes later. This can be thought of as a batch processing approach. However, a simpler way to do this is, while you slowly run the sweet wort out the tap at the bottom of the mash tun, you slowly run hot water in at the top, thereby matching what flows out with fresh hot water flowing in. This can be thought of as a ‘continuous process’ compared to the ‘batch process’ of the point above. As a rule, if you open the tap at the bottom, allow the wort to run out and continuously replace it at the top with fresh, hot (75°C) water, then you will get the majority of the sugars out inside of one hour. And this process is called sparging. Straight forward or what? You’re probably wondering by now where exactly all this sweet liquid goes to ? Well, you have another container, called a ‘boiler’ or ‘kettle’ that is capable of heating the wort. This container is then used to bring the wort up to boiling point, where you should keep it for another 90 minutes. In homebrew terms this is usually a 25 litre bucket with a tap on one side and a kettle element fitted on the other. Any enzymes in the wort will be killed (denatured). The wort itself is sterilised, i.e any bacteria present will die. You get to throw in hops and boil them to extract various compounds from them. Other things do happen but this is a beginner’s guide OK!! The main reason for the hops is that, if we didn’t add them, our final beer would not taste balanced, likely very sweet and not that palatable. So somewhere back in the mists of time people started throwing a variety of plants and roots in to temper the final sweetness of the fermented beer. And of couse the best way to extract the flavours etc is to boil them in the wort. If we throw the hops in at the start of the 90 minute boil they allow us to get a bitter flavour into the final beer. The longer they get boiled for, the more bitterness they impart. After about 90 minutes, any bitterness they have, will have been imparted so we don’t usually boil for longer than 90 minutes. If we throw some hops in with about 15-20 minutes of the boil still to go then their flavour will remain in the final beer. If we throw some hops in during the last 2-5 minutes of the boil then their aroma will remain in the final beer. So, hops can give us aroma, flavour and bitterness in the final beer and by controlling how much we add to the boiling wort and for how long we boil them, we can control their contribution to the final beer. And that’s the boil. After we have boiled our wort for 90 minutes and we have happily thrown handfuls of hops in, we are essentially finished what we refer to as the ‘hot-side’ of the process. From here on in we need to chill the wort and process it closer to room temperature. We also now need to start sterilising everything that the wort comes into contact with, up to now things need only be kept clean, not sterile. So, after the 90 minutes boil, we allow the hops to sink to the bottom of the boiler (below the level of the tap so we don’t get them clogging up our tap) and we then run the wort off to the fermentation vessel. Run the very hot, freshly boiled wort into a fermentation vessel, seal its lid on (to keep bacteria out) and then let it cool down in the fermentation bin. Left alone this can take 3 hours to get right. You can speed this up by dunking the bin in a bath of cold tap water but it’ll still take around one hour to achieve and risks infecting the wort. The second way is to insert a copper coil into the boiler at the end of the boil and to run cold tap water through the inside of the coil. If you combine this with a gentle stir of the wort you can chill 23 litres of boiling wort to room temperature inside of ten minutes. This cold wort is then run into the fermentation vessel. The third way is to make what’s called a counter-flow chiller. This is not too difficult to make and you get to run the hot wort through the inside of a copper pipe while passing cold tap water through another pipe (that surrounds the copper pipe), doing so in the opposite direction. The wort then enters at one end at a temperature close to boiling and exits 10-20 seconds later at the other end close to the temperature of the tap water. This process typically takes 10-15 minutes for a 23 litre batch of beer but remember that the wort itself is being chilled down to room temperature inside of 10-15 seconds (i.e. the time it takes to go through the chiller). This has benefits that I won’t go into here but is a nice route to follow. And when you have your wort at a temperature close to room temeperature you have successfully chilled your wort, well done. Once you have a 25 litre fermentation bin with some 22-23 litres of room temperature wort its time to ferment it. ‘Fermentation’ means the step in which the ‘sugars’ in your wort get converted into alcohol and carbon dioxide gas (CO2). The process is thankfully handled for you by a micro organism called yeast. Yeast converts the sugars in the wort into two main by-products, namely alcohol and CO2. You won’t notice the alcohol until you eventually drink the beer but you will notice the CO2 gas as it likes to escape in large volumes from your fermentation bin. Other by-products also get produced and these help form the overall character of your beer. Don’t worry about what they are, just know that they’re there and be thankful for it ! In the simplest sense, once all of the sugars in the wort have been converted, the yeast runs out of work and like everyone else, decides to take a nap and promptly drops to the bottom of the fermentation bin. Yeast which sits at the bottom of your fermentor is not doing anything really useful and so, once most of the fermentation is over (the rate of escaping gas slows down), you would be wise to transfer the beer into a second fermentation vessel, thereby allowing the yeast to finish the last 5% of its job and for the beer to settle out so it can be bottled. Inherent in this statement is that not all the yeast stops working at the same time, the earlier the yeast stops working, the less likely you are to want it in your beer. Its kind of like employees, the less useful ones fall by the wayside first and need to be pruned out (sorry but its just very difficult to train up dead yeast cells), the more useful ones will stay for the duration. OK, so the yeast has done its job and you now have ‘beer’ in your fermentor. And please, before you jump up and down shouting about how you have just made ‘beer’, remember you didn’t, you made ‘wort’, the yeast made the ‘beer’. Team work at its best. Once you have the fully fermented beer in the fermentor, you need to ‘package’ the beer so you can drink it. I mean, after all, its pretty difficult to carry the fermentor to the party, not that people haven’t tried ! Also, you need to recall the fact that beer is traditionally served with some degree of ‘fizziness’, commonly called ‘carbonation’ because of the CO2 dissolved in the beer. To carbonate the beer you can either put it in a keg and crank up the pressure from a gas bottle or you can ask the yeast for one last favour . . . you add some extra sugar back into the beer (a procedure known as ‘priming’) just before you bottle it and any yeast still in suspension will convert it into yet more alcohol and CO2. But if this happens inside a sealed bottle then the CO2 is forced to dissolve into the beer and this provides the beer’s level of carbonation. Keep in mind that even if your beer appears clear to your eye, there can still be 100,000 yeasts cells per cubic centimetre… think about it ! 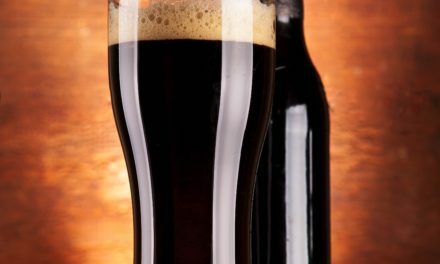 The traditional homebrew method of carbonating beer employs exactly that, a ‘second fermentation’ in the bottle. Such beer is called ‘bottle conditioned’ beer. And that’s that, the brewing process in a nutshell ! All that remains is to summarise it. I always feel the best way to explain anything is to use a picture or graph, so here’s your summary! Picture 4.2 : The assembled ‘Mash Tun’ – Two 25 litre plastic bins. Picture 4.3 : A view of the inner bin with its base drilled with 2 – 3 mm diameter holes. Picture 4.5 : A counter flow chiller : The black pipe is a hose pipe and the copper piping runs inside of it.